Funny speech writing, contrary to common belief, is serious business. It takes a lot of hard work to write something that can make people laugh, and that's no joke. When you're writing a speech for a room full of people, it's a completely different animal than writing a few jokes for use at open mic night at the local comedy improv. Whereas a comedy club audience is there specifically to laugh, a speech is not necessarily supposed to be a laugh riot, so the laughs have to be strategically placed and the speech tightly structured. If you stop to think about it, how many people do you know who share your sense of humor? A few if you're lucky, but it's not everybody you know. If you write jokes that you find to be hilarious, understand that only a small percententage of the crowd listening to your speech will find what you have to say funny. Crowds are incredibly diverse and the trick to effective funny speech writing is to hit on something that each and every member of the audience will find funny. While the entire crowd won't all laugh at every one of your jokes at the same time, if you put away your ego and write for the masses, you'll increase your chance of hearing chuckles and guffaws right where you planned on hearing them - and the good thing about laughter is that it's contagious. Once you consider your comedic options, take the time to consider your audience. Are you speaking to a crowd of investment bankers or a local church group? Is the crowd predominantly female or are there more men than women? What's the average age of the audience and what is the average income level of the crowd (if possible to gauge)? Most speeches start off with a well-written joke because it not only helps break in the audience and gets their attention - it helps the speaker settle into their position at the forefront of the crowd. That opening line is one of the most important parts of the entire speech because there's nothing worse than hearing crickets from the outset. Get them laughing early and it will be easier to keep them laughing when they're supposed to. Use language that's appropriate for the audience and keep it as clean as possible. While master comedians like Richard Pryor and George Carlin were able to kill using four-letter words, in a speech, blue language is never accepted - and you're not Richard Pryor or George Carlin anyway, so don't even try it. Avoid off-color or racially-tinged jokes and don't be politically incorrect unless you're speaking in front of a crowd that you know will be accepting of political-bashing humor. If you're speaking in front of a small crowd of people who know each other very well, like family at a wedding reception or a small group of office workers, feel free to pepper in a few lighthearted tales and stories about a few of the people in the audience. Remember though, these jokes will only work if everybody in the audience knows who you're talking about, and never make them insulting or mean-spirited or the crowd could turn on you in a heartbeat and you could wind up hurting someone's feelings in the process. Lastly, remember your reason for writing the speech. Don't try so hard to make the audience laugh that you completely miss the topic you are supposed to be talking about. 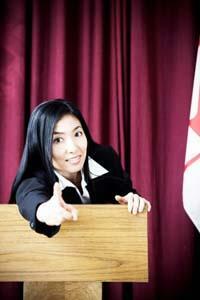 A well-written speech will have just the right balance of funny moments while still delivering the goods.